I have occasionally been asked about, or sometimes even been criticized for, my intermittent reporting on matters of the Catholic church. 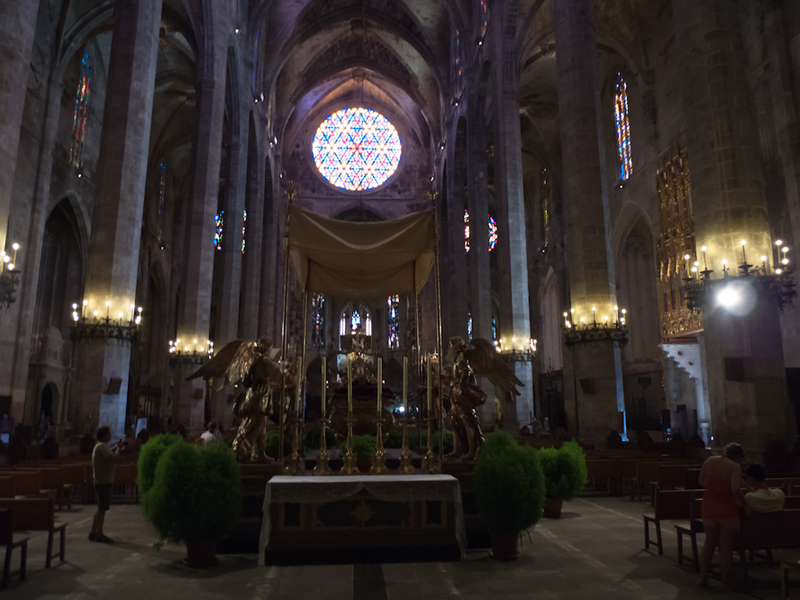 There were suggestions that my blog entries on monasteries in Mallorca, on churches, chapels and the Cathedral, or on festivities related to saints and saints’ days amount to promoting the Catholic religion or something to that extent. 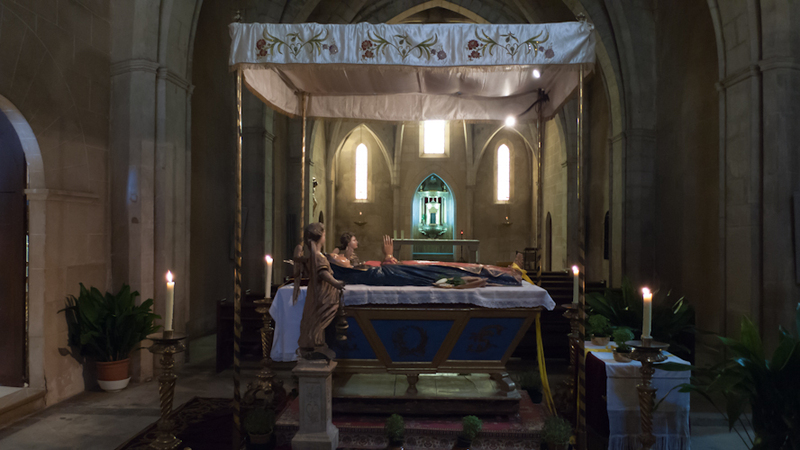 I keep explaining that an exhaustive blog on the subject of Mallorca would be flawed if it did not include references to matters of church traditions in a country as deeply entrenched in the Catholic religion as Spain was and still is. No, I am not a Catholic, I never was and I never will be. If I did a blog on Japan, I would certainly have to include topics of Shintoism or Buddhism quite frequently, don’t you think? Every time, I point out that I continuously aim to give equal attention to other religions such as Islam, Sufism, Judaism, Buddhism, Sikhism, Shintoism, Mormonism or Jehovanism. After all, there has been a time in Mallorca when Catholicism, Islam and Judaism coexisted in perfect harmony for a few hundred years, or so it is sometimes claimed. Okay, I have never reported on Scientology and I am not sure that I will ever consider it relevant. Allow me to talk about the Virgin Mary once more, on occasion of the recent Festivitat de l’Assumpció de La Mare de Déu (Ascent of Virgin Mary). 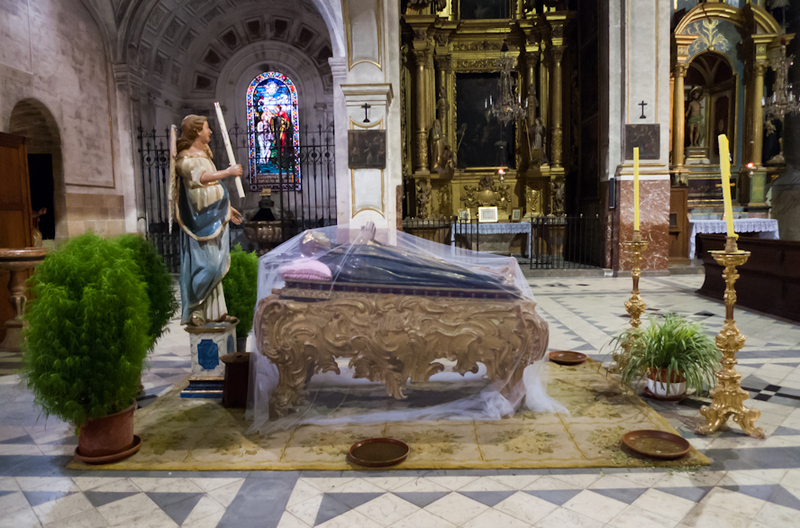 The celebration is also called Dormició de Maria (Dormition of Virgin Mary). I have visited a number of church exhibitions of the Slumbering Beauties over the last number of years and this year, was all intent on filling in the gaps that I might have missed in the past. Easier said than done. When I was in Palma last Friday, I approached six churches plus the Cathedral but, I found myself locked out in all of them but two. Saturday and Sunday, the same happened in the pueblos. Of seven churches, only three were open for visits at the time of my arrival. For your perusal, I am offering you reclining Mare de Déu Dormida examples taken in – from top to bottom – La Seu (Cathedral) and Sant Miquel in Palma, and Campos, Felanitx, Santanyí and Porreres in the Part Forana (the hinterland). 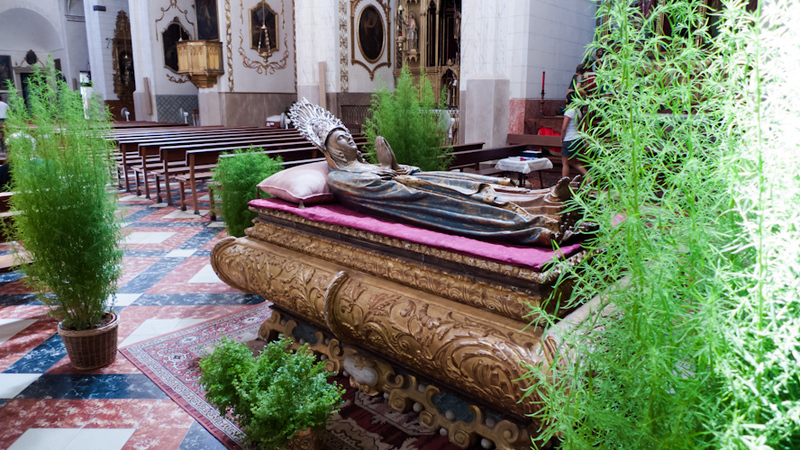 I was told that the most beautiful Virgin Mary statue was laid out in the parish church of s’Arracó (Església de Sant Crist), but I did not get there before time and the display there is now no longer on view, until next year. This year, some installations will be on display until August 22nd. 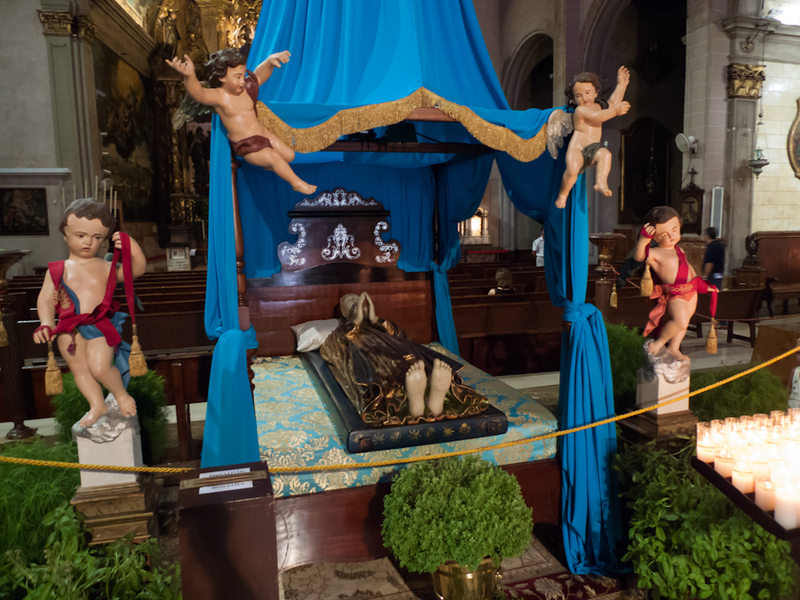 The parish church in Santanyí will show its sleeping beauty (above) until August 21st, the parish church in Muro, until August 23rd, and the church in Alaró, until August 25th. In Palma, the exhibition at the Església de Sant Francesc comes to a close on August 22nd, as will the one at La Seu de Mallorca. An exhibition Mostra de la Mare de Déu d’Agost will be open at the Monestir de la Puríssima Concepció until August 23rd. 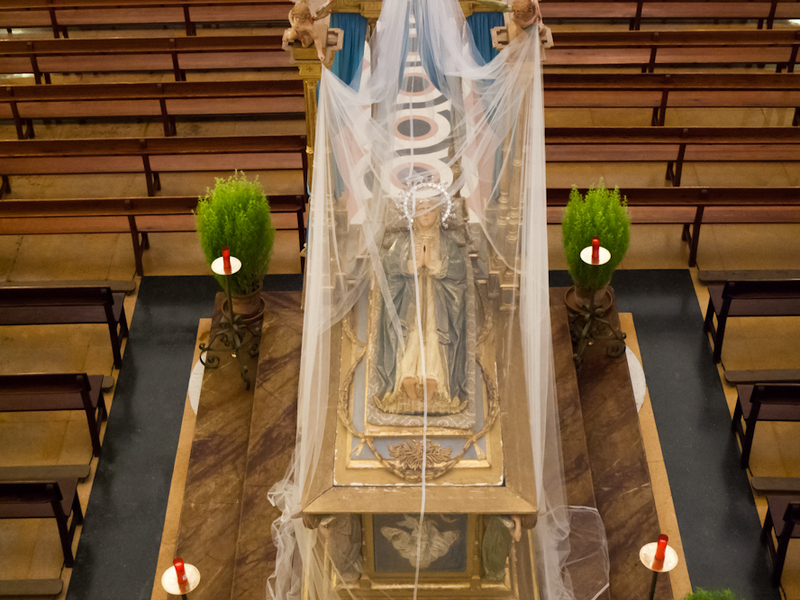 A Funeral Procession of the Ascending Virgin will be held on August 22nd at 19h00 at the Església del Monestir de la Concepció. The photos were taken, from top to bottom, in Palma de Mallorca, Baleares, Spain. The date: August 17th, 2012. The time was 15:28:09 and 13:34:54, Campos, August 18th, 2012, at 11:05:14, Felanitx, August 15th, 2012, at 11:56:02, Santanyí, August 18th, 2012, at 12:09:45, and Porreres, August 19th, 2012, at 20:28:38. I agree with you Klaus. Ignore the detractors. We have been following your blog a long time now, both whilst in Mallorca and away from here and almost always enjoy it. It is a wonderful summary and education about our lovely island. The phenomenal apparition of Mary at Zeitun, Egypt began on April 2,1968 and lasted for three years. During that period, she was witnessed by more than 4 million people, photographed and televised. Egyptian President Abdul Nasser also saw her. Egyptian police searched a 15-mile radius around the site but could not find any form of equipment that could project images in such a manner. The apparitions lasted up to 9 hours, and were accompanied by doves of white light. Fragrant purple smoke rose from the church at the same time. An orthodox commission was formed to investigate the phenomenon, and several members observed the events. The apparitions were silent, but they spoke volumes to the faithful who witnessed them. They received little publicity outside of Egypt. When someone complains that you cover Catholic matters too much, it says more about their own frame of mind than your own. Narrowmindedness shows itself in many ways. I follow four blogs from Muslim countries; the bloggers are not Muslim (in fact one is an atheist) but it would be odd for them not to give considerable attention to Islam, especially during Ramadan. As I’ve mentioned previously, one of the things I enjoy most about your blog is the variety of matters Mallorcan that you bring to our attention. You are certainly one of the most dedicated bloggers I follow and the amount of detail and attention you provide is admirable. Those who feel annoyed in some way can always exercise the option not to read a particular entry or, indeed, to go elsewhere. Keep up the good work. excellent stories, I enjoyed reading your blog, I am Palestinian and in love with history, specially with the love-hate relationship between east and west, which clearly I can feel through the stories in Majorca island or shall I call it Mayorka (smile).